Hydrocephalus is a condition that occurs when there is too much cerebrospinal fluid in the ventricles (cavities) of the brain. Cerebrospinal Fluid is a clear fluid that bathes the brain and spinal cord, providing a cushion, nutrients and carrying away waste. Normally, this fluid cushions your brain. When you have too much, though, it puts harmful pressure on your brain. Hydrocephalus can be inherited genetically or is also often associated with conditions that affect the brain and /or spinal column, such as meningitis and spina bifida. Currently, 80-90% of people with spina bifida also have hydrocephalus. Other causes can include bleeding within the brain, brain tumors, head injuries, complications of premature birth such as hemorrhage, or diseases such as meningitis or other infections. In some cases, normal flow of CSF within the brain is blocked, resulting in fluid build-up. 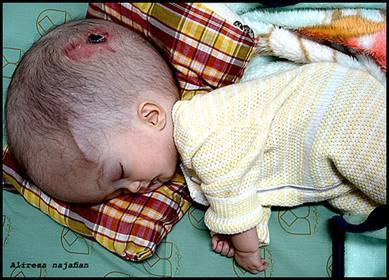 Hydrocephalus may be congenital or acquired. Congenital hydrocephalus is present at birth and may be caused by either events or influences that occur during fetal development, or genetic abnormalties. Abnormal enlargement of baby's head; headache; nausea; vomiting; fever; blurred or double vision; unstable balance; irritability; sleepiness; delayed progress in walking or talking; poor coordination; change in personality; inability to concentrate; loss of sensory motor functions; seizures; or poor appetite. Older children may experience difficulty in remaining awake or waking up. In adults, the skull is fixed and cannot adjust to changes in pressure. Irritability and other changes in personality. The most common ways for diagnosing hydrocephalus are the CT (computerized tomographic) scans and MRI (magnetic resonance imaging). They can accurately measure the size of the fluid spaces, or ventricles, within the skull.